What a fantastic dish for an easy holiday dinner and the best thing about this recipe is that it is made ahead of time leaving plenty of time to prepare a few of your favorite side dishes on the day that you are serving the pork for dinner. I am considering making this recipe sometime during the Christmas and New Year’s celebrations, so easy and perfect for a potluck dinner and destined to become a holiday favorite around here. Score the skin of a bone-in fresh pork shoulder into a crosshatch pattern, cutting down through the fat to the meat. Pierce little slits all over the pork and stuff garlic halves garlic them into the slits. Dry the meat well, then shower it liberally with salt and freshly ground pepper. Cut the onions by halving them lengthwise and then ribboning them into long slices. Set them aside while you heat a couple of tablespoons of grapeseed or canola oil in a heavy pot and brown the pork on all sides. 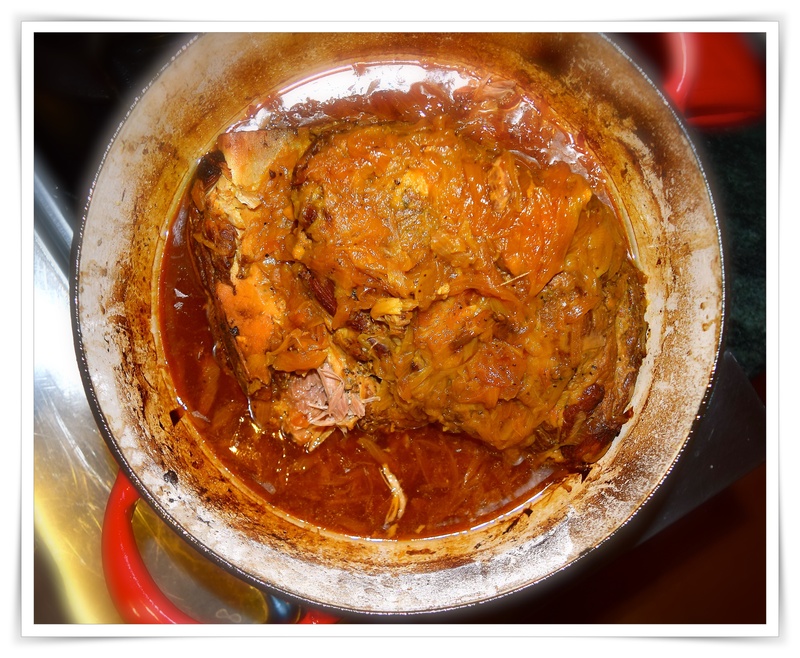 When the meat is browned on all sides, remove it to a platter and add the onions to the pot. Cook, stirring occasionally until they’re fragrant, golden, and caramelized. 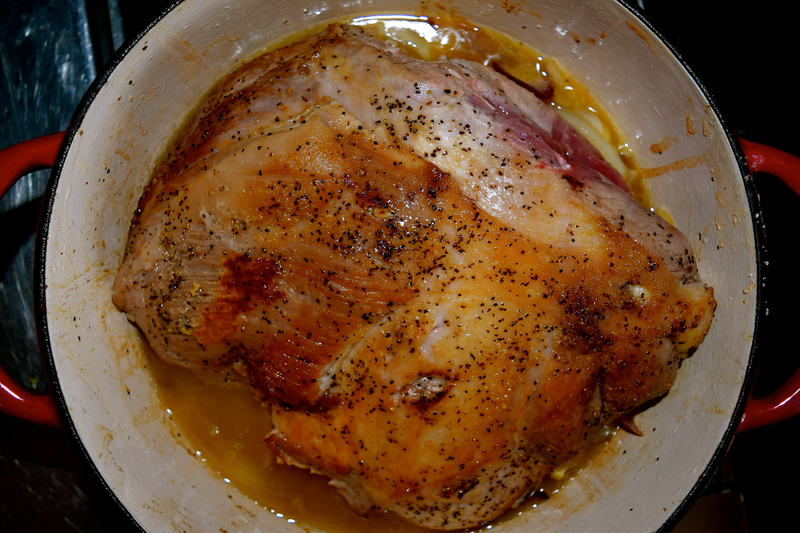 Season with salt and the apple cider, return the pork to the pot, cover it securely, and put it into a 325-degree oven for 3 hours. After 3 hours remove the pot from the oven, uncover it, and allow it to cool. Put the cover back on and set the pot in the refrigerator overnight. Two or three hours before you plan to serve dinner, take the pot out of the refrigerator and lift off and discard the solidified fat that’s risen to the top. Allow the meat to come back to room temperature, then reheat it in a 325° oven for another hour. Lift the pork onto a platter and measure the onion-cider mixture that’s left in the pot. If it is more than a quart, bring it to a boil and let it cook furiously until it’s reduced to one quart (4 cups). Taste and add as much salt and pepper as you think it needs. Enjoy with freshly baked cornbread or in our case take and bake dinner rolls cuz the cornbread didn’t turn out so terrific!